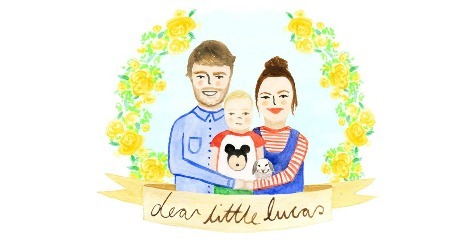 Finding a boys name was easy, I remember how easily we found Lucas'. We found his name 3 days after we found out we were expecting him and fell in love with it. We struggled majorly with a girls name and settled on Ella. Although obviously we never used it. We didn't like it enough to use it this time. Once again trying to find a girls name was really difficult. We found a boys name really easily again. We fell in love with Arlo; it was a name we just loved and then became excited at the prospect of buying "him" lots of 'the good dinosaur' merchandise to match "his" name. If she was a boy, or if she pops out a little boy by a crazy chance; she would have been Arlo Ted Walters. Ted after Brad's grandad. Weeks and weeks, as we're super eager and love finding names early and being set on them when we find out the gender, went by and we batted back and forth. When we were pregnant with Lucas, this was one of our girls names I liked and Brad wasn't keen on but didn't hate it. We both decided that we loved the name "Iris," I use to look after a little girl named Iris, and she was beautiful, and the name has always stuck with me. I love old fashioned names and Iris to me is old fashioned but super pretty too. It's not like an Edna. Iris' name meaning made us really fall in love with it too. Iris means Rainbow in Greek. Iris was the name of the Greek goddess of the rainbow. Obviously being our rainbow baby, this made me really fall in love with it. Finding a middle named proved harder, we always said we'd use Brad's nan's name, or possibly my mum's name, but neither flowed well. Iris Charlotte, just didn't have a great ring to it, and Iris Winifred or Iris Wyn, made her sound like an old lady and both agreed they didn't work. No other family names worked either. So we made the decision to chose something random. We googled back and forth, middle names that go with Iris and we came up with Elizabeth, mae, and a few others and just didn't love them or Brad didn't even like them. Whilst googling October names, autumn names ect... thinking outside the box, we came across "Rain" and we thought wow, thats pretty, it's unusual but really pretty. We decided to make it look less like the weather so we chose "Raine" with a subtle "e" on the end. We googled the meaning again as I'm a sucker for a name with meaning and fell in love all over again. It was perfect. The meaning of the name Rain is: abundant blessings from above. Could you get anymore lovely? Not everyone will love her name, some may think it's horrible, or silly, but it's unusual but not too unusual. It's not Apple or something. I love how the unusual middle name turns an old fashioned name to a more quirky name. The name is very us and to us it's perfect, pretty and the most beautiful name for the most beautiful little girl. Her full name is Iris Raine Walters and we love it. My blog name will be staying the same, dearlittlelucasandiris is a little bit of a mouthful but there will be letters to Iris too, and letters to Lucas and Iris. She'll have as much as a part on my blog but just won't have her name in the domain or header.